Customization, technology and growth. Get it all with the all-in-one, cloud-based solution made just for you. Propertyware is affordable, flexible and scalable, offering easy pricing for a best-in-class solution. With Propertyware, it’s not what you can’t do, it’s what you can. Easy, affordable pricing starting at $1.00 per unit, per month. Three packages to choose from with no hidden fees. Customization your way. Period. From reporting to custom fields, no one else offers what we do. Propertyware grows with you, offering forward technology to manage your business. Stay small or grow big—we’re with you all the way. Simple software solutions. Simple operations. Simple training with extensive offerings. All simple. All you. Propertyware is a complete integrated solution, working seamlessly and in real time. Propertyware provides the visibility into property performance that your owners need, and the communication system that your tenants want. Save time, money and resources by automating everything from your To-Do list, such as tasks, reports and fees. Your data is of utmost importance, and Propertyware knows how to protect it. We’ve invested in a state-of-the-art data center with redundancy, backup monitoring and diagnostic systems so you don’t have to worry. What can we do that they can’t? Everything. One web-based property management system used to replace four disparate ones. Number of days saved during rental application and leasing process. Decrease in late rent payments from using tenant portals. If your property management software isn’t performing at optimum capacity, your bottom line could suffer a setback. 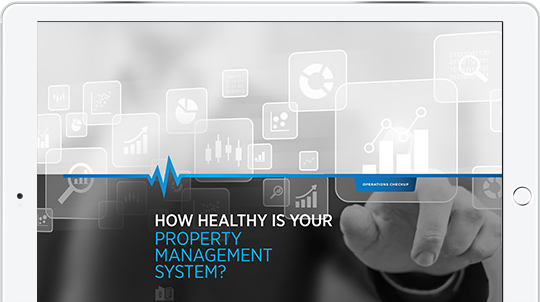 Find out how to assess the needs and performance of your property operations including marketing, reporting, accounting, maintenance and more with this free ebook.